Monochrome Remains. Book Manufacturers Demand B&W. Customers request B&W for a variety of applications from books, legal briefs, and financial statements to newsletters and transactional communications. Print service providers that primarily handle B&W printing use production B&W presses for low costs and quick turnarounds. Founded in 1973, Total Printing Systems is a book manufacturer in Newton, IL. The company was established in a family garage with one employee to produce local business cards, letterheads, and forms. In over 30 years the company has become a full-service book manufacturer, producing almost exclusively books with 50 employees in a 57,000-square foot work space. Total Printing Systems work primarily with small- to mid-sized publishers with customers both nationally and internationally. As producers of business cards and books, the company began by offering one- and two-color printing capabilities. “Books have historically been primarily B&W in the interior. 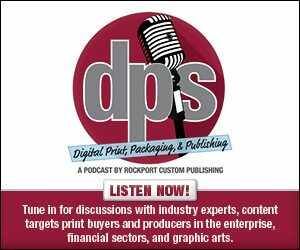 It hasn’t been until recently that it’s become as economical as it has to add color to book interiors,” says Rick Lindemann, president, Total Printing Systems. In 2001, Total Printing Systems installed a Kodak VersaMark black-only inkjet press. However, Lindemann says the image quality was only acceptable for a small percentage of customers by 2008. In 2009, the company purchased the four-color Screen TPJ 520S to a VersaMark presses. Lindemann says as requests for four-color volume grew, the company soon hit capacity issues on the TPJ 520S due to the requests for B&W volume. It wasn’t until 2013 that the company found newer technology for monochrome inkjet web presses. “As soon as they were available, we jumped on one,” says Lindemann. After evaluating the market, Total Printing Systems installed a Screen TruePress Jet520EX-Monochrome. The Jet520EX has a paper width of 6.5×20.47 squared inches and resolutions up to 720 dpi. It uses water-based inks and is intended for commercial, publishing, and transactional applications. “We were actually leaning toward another device, but in the end, the combination of image quality and overall print cost that Screen offered ended up making the most sense for us,” explains Lindemann. For book interiors, Total Printing Systems uses a variety of papers depending on the customer’s preference. The company primarily uses Flambeau River Papers Torchglow Opaque for projects printed on 50, 60, or 70 white sheets. For a gloss coated sheet, it uses Mitsubishi Sword Gloss in the 90, 105, 128, and 157 gsm weights. Premium inkjet-treated sheets are usually Appleton Coated Ethos Enhanced Inkjet. “We use this sheet to increase the vibrancy of the ink and replace a matte coated sheet, as its heavy treatment gives it a matte coated look and feel,” offers Lindemann. The company receives most of its artwork from customers as print-ready PDFs, therefore, with its monochrome work, the company preflights in Adobe Acrobat and imposes for press using Quite Imposing. Quite Imposing is a plugin for Acrobat and combines pages onto larger sheets for books, booklets, and special arrangements. Over the years, Total Printing Systems has used several different finishing devices. Lindemann says that in 2008, there weren’t many options on the market for roll-to-cut sheet book blocks. “We tried and failed and ultimately ended up with a POPP6 System from Hunkeler, which we installed in 2010,” he says. POPP6 is a roll-to-roll solution with configurations for continuous feed digital presses. It has a maximum width of 20.5 inches and is intended for books, brochures, direct mail, newspapers, security print finishing, transactional, and TransPromo applications. “Hunkeler’s equipment is a little more expensive than some of the other options out there, but its robust, runs well, and ultimately, it’s worth the money,” adds Lindermann. As a book manufacturer, Total Printing Systems primarily focuses on the publishing. However, Lindemann says that several other industries like directories, catalogs, and parts and training manuals utilize monochrome printing for its utilitarian function and low price point. “Between the equipment and ink costs, the cost for printing black only can be close to a third of a comparable four-color product,” he explains. While Lindemann says there are several benefits of B&W printing versus printing full color, he believes that depending on the application, black only print is less distracting and easier to read than a four-color version of the same product. “Sometimes less is more when you’re trying to convey a message,” he offers. Now that high-resolution, B&W digital print equipment is available, most new trends and equipment are related to higher resolution printheads, inks, and ink optimization software. “It’s really just a matter of keeping up with software, hardware, and ink updates,” says Lindemann. While color is essential for some print applications, monochrome still plays a significant role in the growth of production digital print. Print providers and book manufacturers like Total Printing Systems still rely on B&W production printers for efficient B&W printing. Click here to read part one of this exclusive online series, Classic Prints.